Is the whole country crazy, or are they onto something? The belief that a supply of combustion air directly from outdoors is necessary for a wood stove to operate safely is, for many people, just common sense. Back in the 1980s we all preached the need for outdoor air to be ducted into every stove to make sure it gets the air it needs to operate normally. Then in the late 1980s the research division of Canada Mortgage and Housing Corporation (CMHC) sponsored a big research project to find out how outdoor air supplies worked. The results were a shock to everyone. The testing clearly showed that outdoor air supplies don’t isolate the appliance, don’t prevent smoke spillage into the room and that wind around the house can cause reverse flow in outdoor air ducts. Once we had all digested this news that turned our assumptions on their head, one simple fact stood out: air flows to zones of lower pressure through any available opening. Clearly, air does not flow where we want it to, no matter how much we wish it would. It took several years and several more research projects to confirm these findings and convince key people that this was no fluke and that outdoor air was really not the answer to all our problems. 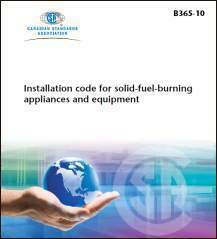 Finally in 2001 a major change to the Canadian solid fuel installation code removed mandatory outdoor air supplies and instead substituted two options in its place. The code, CSA B365, called for either a powered make up air supply to compensate for powerful exhausts like kitchen range hoods, or a carbon monoxide detector at ceiling level in the hearth room. It is a little more complicated than that, but that is the essential rule. Today in Canada powered make-up air supplies and outdoor air ducts are rarely installed except for some fireplaces and even when they are installed, outlet is often closed or disabled because they tend to cause other problems. So, do wood stoves in Canada starve for combustion air or fill houses with smoke and carbon monoxide? Are Canadians dropping like flies? Not at all. In fact the outdoor combustion air debate went silent and hardly anyone noticed. To help users of the CSA B365 code understand why the changes were made, the following non-mandatory appendix was added to the document. Note: This Annex is not a mandatory part of this Code. Requirements and recommendations for the provision of combustion air from outside the dwelling have been changed significantly over the various editions of this Code. This Annex provides the rationale for the changes. In the 1980s, it was thought that smoke spillage from wood-burning systems could be reduced or eliminated by providing a supply of outdoor air to the appliance. This outdoor air was supplied either directly to the combustion chamber of the appliance or indirectly in the form of a makeup air supply linked to, or in close proximity to, the appliance. Underlying the concept of outdoor air supplies was the belief that most combustion spillage was the result of wood-burning appliances not receiving sufficient combustion air from inside the dwelling. However, research conducted in the late 1980s by Canada Mortgage and Housing Corporation revealed that flawed wood appliance venting system design and not inadequate combustion air was the major factor in combustion spillage. Other research showed that outdoor air supplies were not a simple or effective cure for spillage and that some designs could create a fire hazard. Clauses D.3 to D.5 provide a summary of the research findings. Indirect, makeup-type air supplies respond mainly to the house pressure relative to atmospheric pressure outside, not just to the air requirements of the combustion appliance. An indirect air supply functions simply as a hole in the house envelope, and its principal effect is to change the leakage pattern of the building. Therefore, an indirect outdoor air supply is not an effective strategy for resolving combustion venting problems because it cannot reliably prevent or reduce combustion spillage nor provide protection from depressurization. Air supplies routed from outside directly to the appliance combustion chamber do not isolate the appliance from room pressure as was originally thought. Direct air supplies can reverse flow direction if the outdoor weatherhood is exposed to wind-induced negative pressure in excess of chimney draft. The flow reversal of hot exhaust gas through such a duct can create a fire hazard. Also, if the house is depressurized to a level greater than chimney draft, spillage will occur from any available opening in the appliance and venting system, so no protection from depressurization is provided by direct outdoor combustion air supplies. In other words, the negative house pressure at which an outdoor aired appliance will spill smoke is about the same as the level at which an appliance that takes its combustion air from the room. It is now generally agreed, based on research findings, that protection against depressurization can best be provided by evaluating and, if necessary, adjusting the pressure in the house by supplying makeup air from outdoors so that the pressure remains within the limits tolerated by the appliance, as is set out in Clause 4.1 and its referenced documents. Good wood appliance venting system design, component selection, and proper operation have been shown to be more reliable in ensuring successful venting and in preventing spillage problems than supplying combustion air from outdoors. Although the 1990 edition of the NBCC included mandatory requirements for outdoor air supplies for fireplaces, those provisions were removed from the 1995 edition of the NBCC and replaced with a caution regarding the fire hazard posed by outdoor air supplies connected directly to combustion chambers. However, provincial or territorial building codes might still require the installation of outdoor air supplies for all fireplaces. If provincial or territorial regulations require the installation of outdoor air supplies, the technician should be aware that the possibility of reverse flow exists in air ducts routed directly to the combustion chamber, and that it is advisable to leave some clearance from the air duct to combustible material in case a reversal does occur.